4. What is a Hammer & Hanging Man candlestick pattern? 6. What is Morning and Evening Star pattern? 9. What is Dark Cloud Cover and Piercing pattern? This is a bearish reversal candlestick pattern which forms at the peak of an uptrend. The pattern consists of three candles which are almost the same length. The illustration above gives an idea of the Three Black crows and the Three white soldiers pattern. When is Three Black crows pattern formed? The market players expect a trend change in accordance with psychological and fundamental factors when the commodity price is at the peak of an uptrend and trading at resistance. This results in selling activity which gives rise to this pattern. 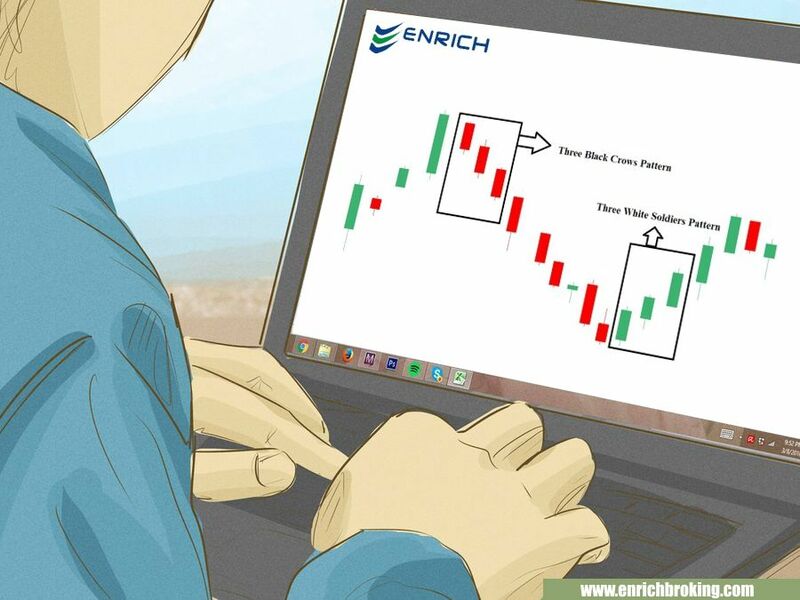 This is a bullish reversal candlestick pattern which forms at the bottom of a downtrend. The open of each candle is above the open of the previous candle. The market players expect a trend change in accordance with psychological and fundamental factors when the commodity price is at the bottom of a downtrend and trading at resistance. This results in buying activity which gives rise to this pattern. The indicates that the commodity trend will make higher highs when all the three candles are present in an uptrend. The Three White Soldiers pattern serves us as an entry point. The Three Black Crows pattern serves us as an exit point.